"It's 1874 and when ten-year-old Rebecca Kelly is sent to the dreary Derry workhouse she decides that this is not the life for her. So she runs away and steals a horse to ride to Belfast. Rebecca is determined that she will join her brother, Felix, who is a sailor on the Queen of... read full description below. It's 1874 and when ten-year-old Rebecca Kelly is sent to the dreary Derry workhouse she decides that this is not the life for her. So she runs away and steals a horse to ride to Belfast. 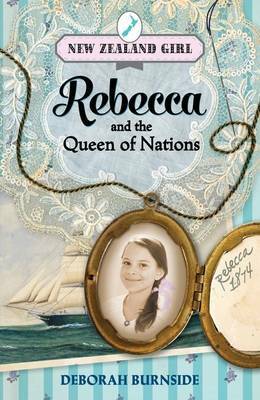 Rebecca is determined that she will join her brother, Felix, who is a sailor on the Queen of Nations, a ship bound for New Zealand, but this will be difficult for a young girl without a penny to her name. Rebecca must become a servant for the Walker family and earn her passage to the new colony. Join Rebecca as she experiences the excitements and fears of life as a nineteenth-century immigrant girl. The New Zealand Girl Series brings young readers quality, accessible historical fiction. Deborah Burnside is from Hawke's Bay and operates an award-winning waste and recycling company, and in her spare time writes books. After a successful placement with Tessa Duder on the NZSA mentoring scheme, her first novel, On a Good Day, was shortlisted for the LIANZA awards in 2005. It's True! This Book Is a Load of Rubbish was published by Allen & Unwin in 2005 and was noted in the Wilderness Awards in Australia. Night Hunting, her first foray into junior fiction, was published by Penguin in 2008 and made the Storylines Notable Books List in 2009. Yes, her second YA novel was shortlisted for the NZ Post Book Awards in 2011.